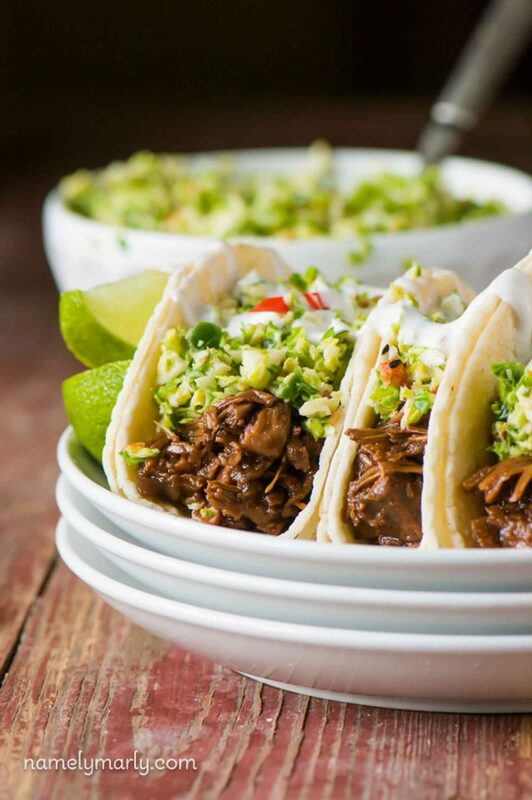 Whether it’s for Taco Tuesday, Cinco de Mayo, or a Dinner Party …everyone needs a few mouthwatering Vegan Taco Recipes to try! Well here’s 25 of them to get you started! Tacos are one of my favorite creations. Endless combinations of ingredients to create different flavors and textures all into one incredible bite. From spicy, smoky, roasted, and peppery to tangy, sweet, and fresh, this list of 25 vegan taco recipes has you covered. Many of them also incorporate flavors from different cuisines. And if you’re trying to incorporate a new ingredient into your diet or looking for a new ways to use it, these recipes are the perfect place to start since they have a wide variety of main ingredients, such as lentils, tofu, beans, nuts, fruits, and/or veggies! Tacos can easily be customized to what you have in your kitchen, making it also the perfect throw-together weeknight meal! And don’t even get me started on sauces, my vegan taco recipes wouldn’t be complete without them! Throw a taco party soon! 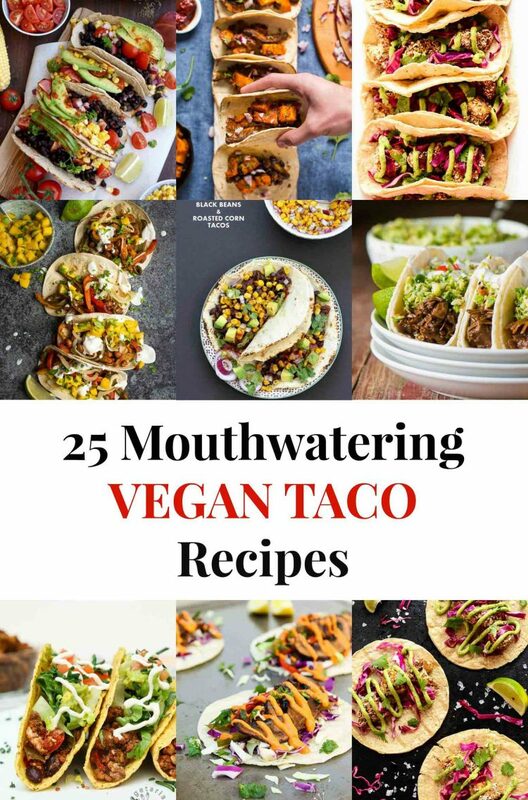 Check out this list of 25 Mouthwatering Vegan Taco Recipes from some of my favorite bloggers and let me know which one you’ll be trying first in the comments below! They’ve all been carefully chosen for their uniqueness, variety, ingredients, and are all relatively easy to make! 5-Minute Easy Vegan Tacos by Happy Kitchen Rocks *. I started off this list with this recipe to show you that tacos don’t have to be extremely elaborate or take tons of time to make to taste good…all you need is 5-minutes! 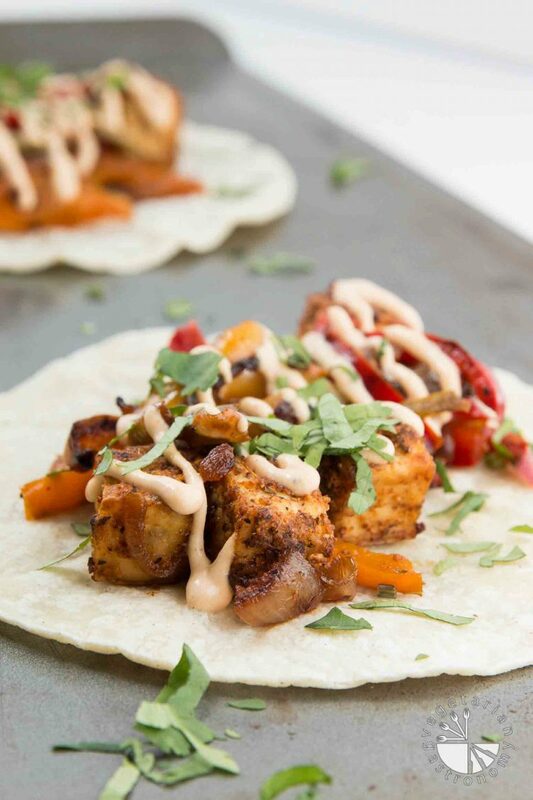 Crispy Tofu Tikka Masala Tacos with Peppers, Onions, & Chilifire Crema by Vegetarian Gastronomy *. 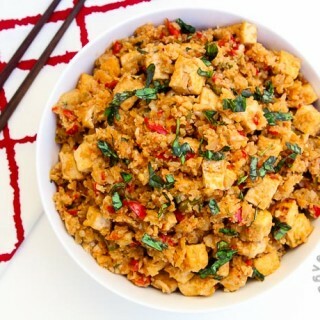 Baking tofu gives it an awesome crispy texture without having to do the work of frying! Pair it up with my favorite ready-to-go tikka masala seasoning and quick 1-minute creamy sauce! Crispy Avocado Tacos with Slaw & Avocado Cream by Blissful Basil *. Avocados are my favorite and can easily be added to any taco, but sometimes they need to be the star of a dish! 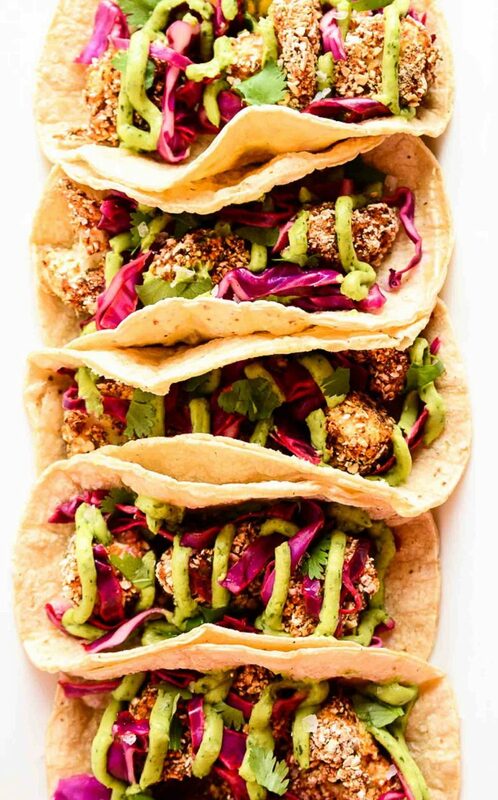 Crispy Coconut Lime Baked Cauliflower Tacos by Veggie Inspired. The flavors of this one had me right away! Coconut & lime combined with crispy tender cauliflower! Vegan Butternut Squash Tacos with Chipotle Black Beans by Avocado Pesto. Sweet butternut squash paired with black beans is a must. Four Bean, Quinoa, & Veggie Tacos by Vegetarian Gastronomy. No major cooking or baking required. 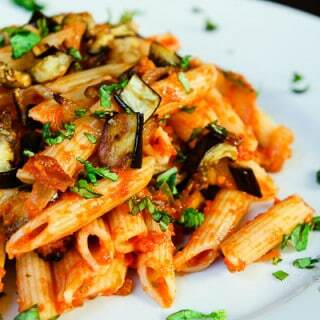 Simply toss everything together and let the natural flavors of the ingredients work magic! I demo’d and served these tacos at both a Whole Foods cooking class and at a Vegan Day event for more than 100 people! One-Tray Tacos with Fresh Mango Salsa by Lauren Caris Cooks *. That mango though…gets me everytime. 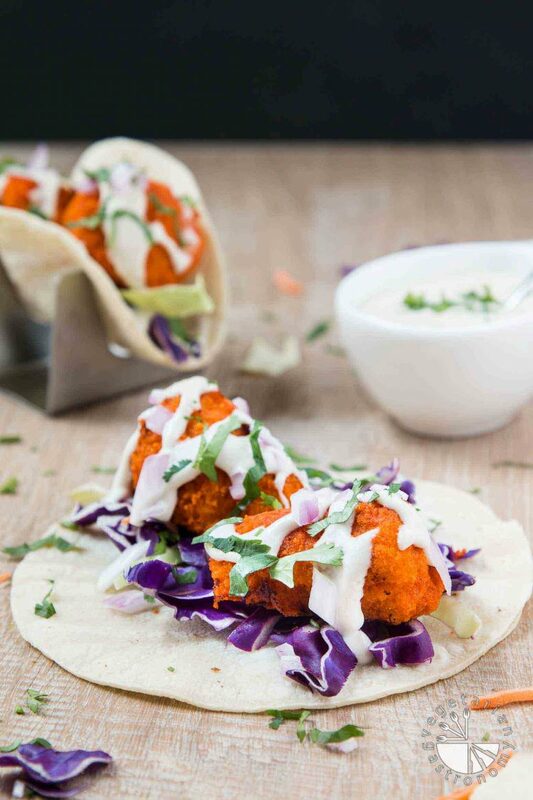 Vegan Buffalo Cauliflower Tacos with Cucumber Ranch by Vegetarian Gastronomy *. Tangy, spicy, cool, and creamy! This crowd pleasing taco will instantly turn you into a cauliflower lover! 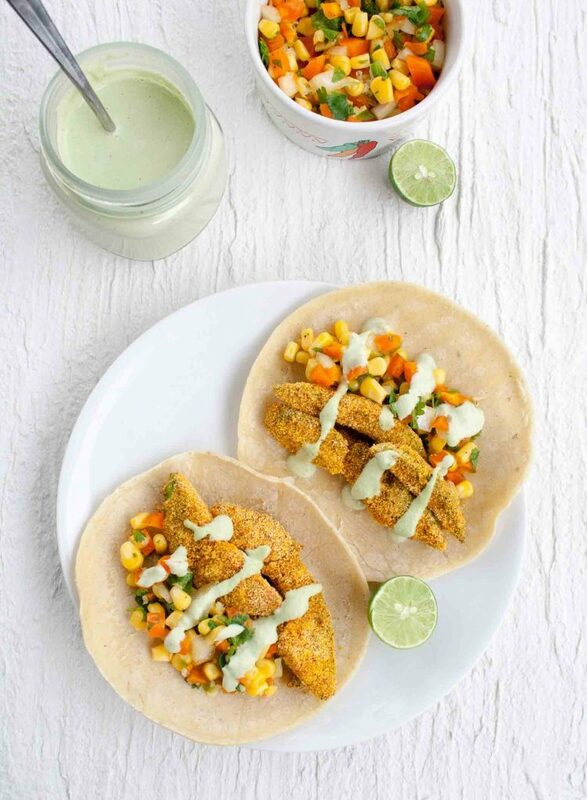 Lime & Cornmeal Crusted Potato Tacos by The Vegan 8. Potato tacos were one of the first non-traditional taco I’d tried years back, and this lime and cornmeal crusted version just took it up a notch. 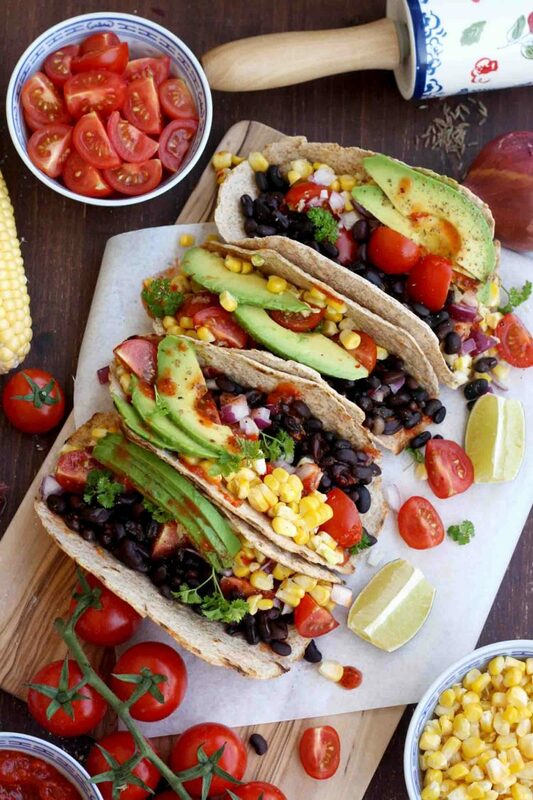 Jamaican Jerk Black Bean Tacos with Roasted Corn Tacos by Vegan Richa *. Trying out new spices and seasonings is what tacos are all about! 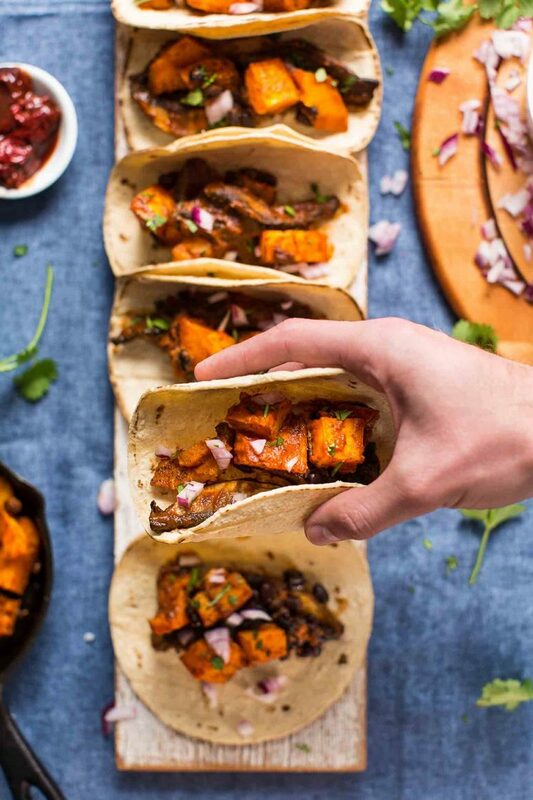 Saucy Portobello & Butternut Squash Tacos by Minimalist Baker *. That spicy adobe sauce paired with portobello and roasted butternut squash. These were a favorite at my holiday party last year! Roasted Portobello Tacos with Chimichurri Sauce by Connoisseurus Veg. The chimichurri sauce caught my eye with these tacos! One of my favorite sauces to use in so many different dishes! 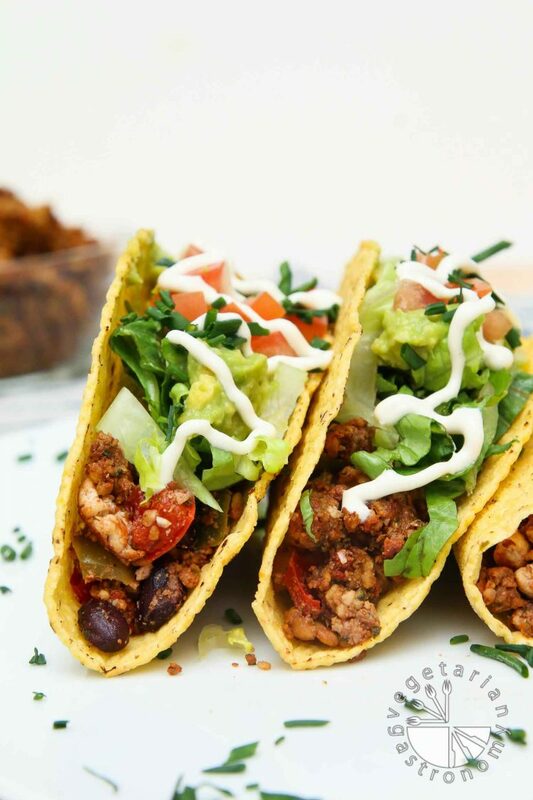 Vegan Tacos with Lentil Walnut Meat by Vegan Heaven. I’m always looking for new ways to enjoy lentils! Loaded Black Bean Tofu Tacos with Walnut Crumble by Vegetarian Gastronomy *. Just take a look at these tacos below. I wasn’t kidding when I said they were LOADED with goodness. Not to mention, they feature my walnut crumble which is to-die-for! 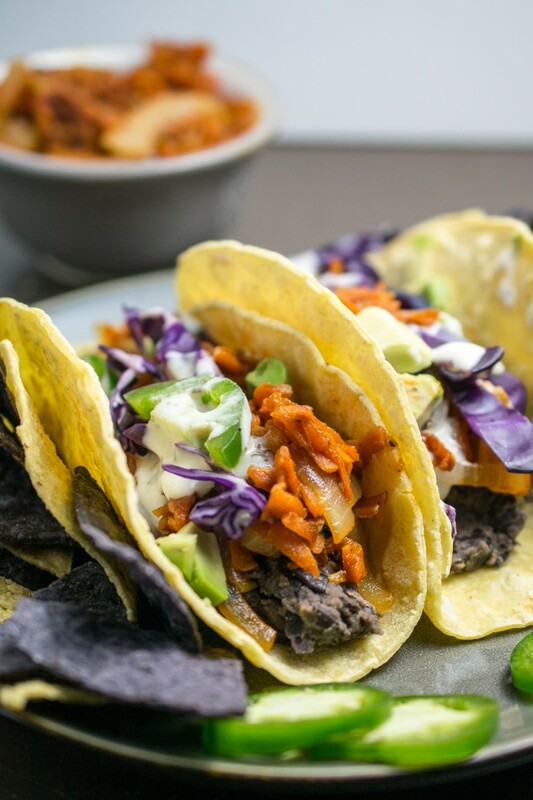 Bulgogi Jackfruit Street Tacos by Namely Marly *. Jackfruit is something that’s so easily available now-a-days and really needs to be tried by everyone at least once! This recipe is perfect way to start! BBQ Pulled Carrot Tacos by Yep It’s Vegan *. Carrots?? Yes carrots. The BBQ pulled carrots in these tacos were so intriguing and sound irresistible! 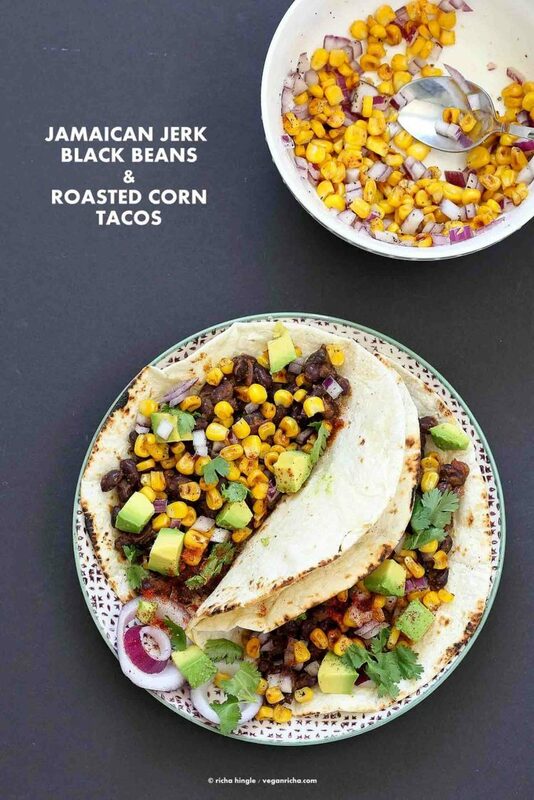 Chipotle, Black Bean, & Roasted Veggie Tacos by Vegetarian Gastronomy. Your basic throw-together-tastes-amazing tacos right here. Sweet Potato Tacos with Avocado Salsa by The Rustic Foodie. Again…that sweet potato and avocado gets me everytime. Quinoa Taco Meat by Minimalist Baker *. A new way to use QUINOA! What a great idea! 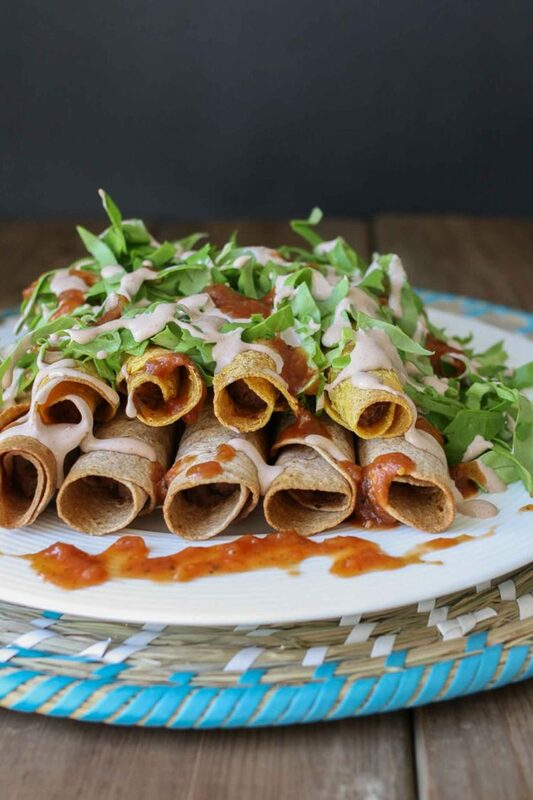 Napoles, Black Bean, & Potato Rolled Tacos with Smoky Taco Cream by Veggies Don’t Bite *. I’ve made these rolled tacos before and they are awesome! They’re also freezer-friendly for quick meals! 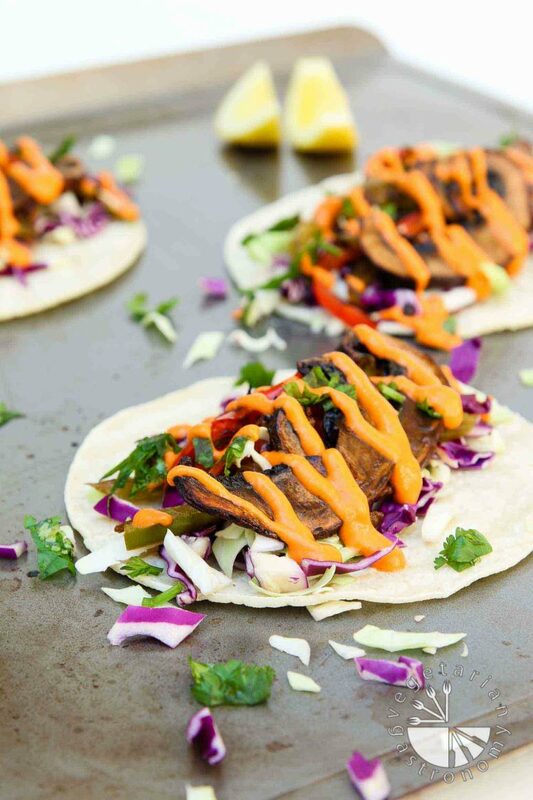 Roasted Balsamic Portobello Tacos with Spicy Red Pepper Sauce by Vegetarian Gastronomy *. I have a thing for perfectly roasted balsamic portobello slices. And that sauce…you’re going to want to add extra. Lentil Picadillo by Thyme and Love *. 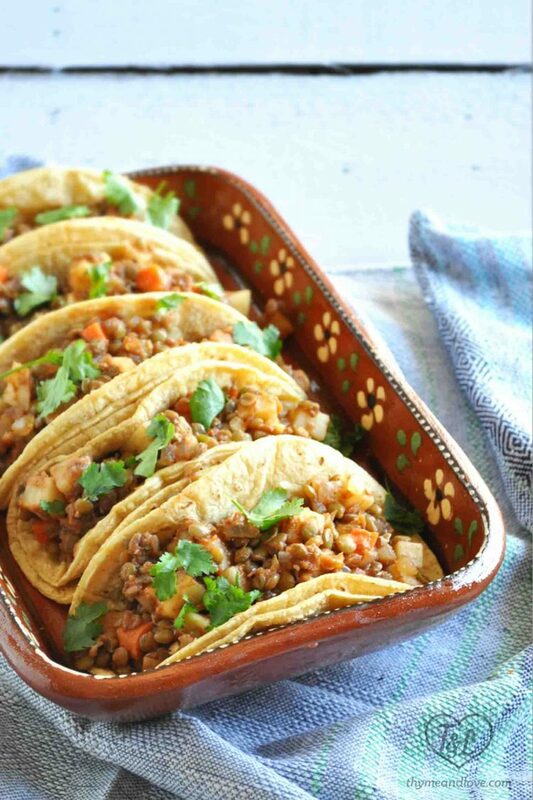 Super easy use of lentils to make delicious healthy nutrient filled tacos! Raw Strawberry Mango Avocado Tacos by Veggies Save The Day. This recipe demonstrates that you can really do anything when it comes to tacos! Vegan Teriyaki Tofu Tacos with Roasted Pineapple Salsa by Rabbit and Wolves. Teriyaki, tofu, and roasted pineapples. This recipe definitely needs attention. 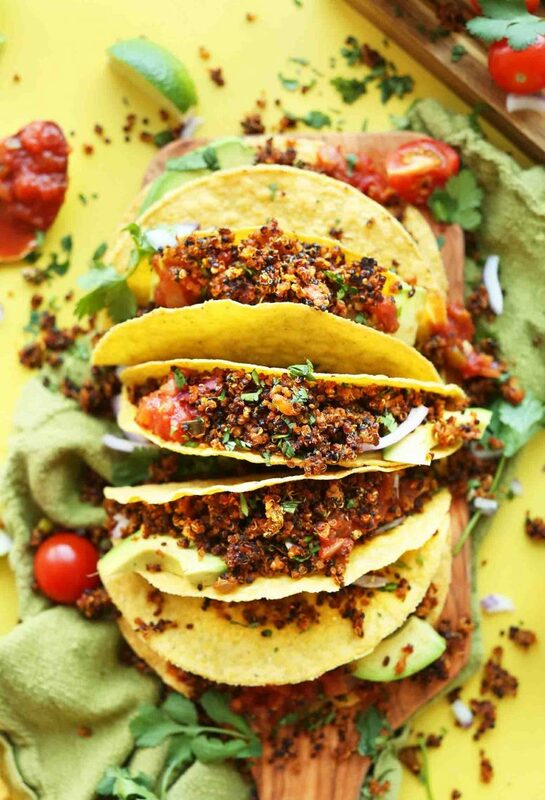 Cornmeal Baked Avocado Tacos by Create Mindfully *. That cornmeal again…works wonders for that creamy inside crispy outside texture! Everyone loves a great healthy taco now and again! These all look so yummy! I can't wait to check these out further. Thanks for sharing my Cornmeal Baked Avocado Tacos! I just shared on a bunch of social media platforms. Thanks Willow and I love your tacos!! I spent time drooling on every single one of these...hoping to try your recipe out soon! Thanks for sharing! Those Cornmeal Avocado Tacos look like HEAVEN! I cannot wait to try them! Thank you for the fabulous vegan taco ideas!!! Love tacos and the countless variations! Hopefully you try a few of them out. These certainly are mouth watering! How do you even pick one?! I did a double take on the pulled carrot tacos. It looks like pulled pork and I wonder if anyone would even know the difference! I am definitely going to have to try some of these. Thanks for sharing! Oh yeah...i spent quite some time drooling over the pullled carrots as well ha! These are on my list for the next month! These recipes are just how I cook. Fresh and flavorful ingredients. All of these tacos are just that...which is why I LOVE them! I spent quite a bit of time going through which ones I included in this roundup. Thanks! Ah - Tacos! Always a hit. You can never go wrong with them. And it's fun to change up the standard with something different. I had no idea there were this many varieties of VEGETARIAN tacos! Oh this list is so short for all the vegan/vegetarian taco possibliities! The options are really endless and they are all so good!! Thank you! 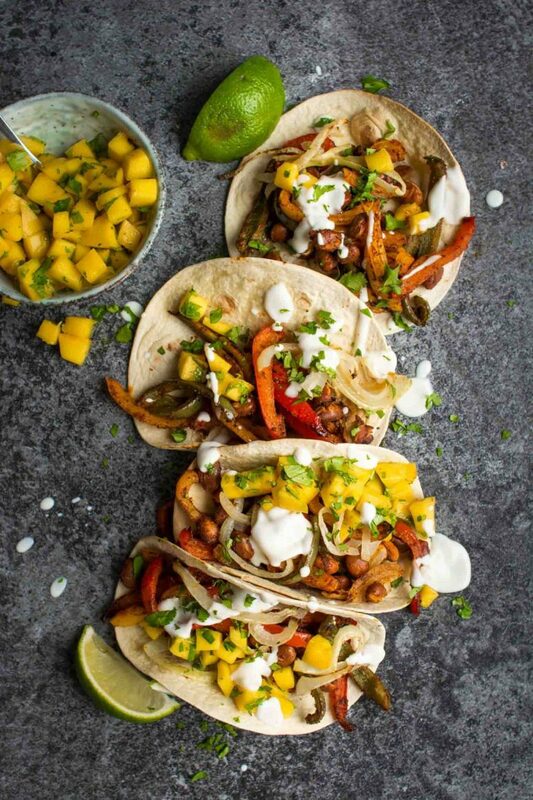 These tacos all look mouthwateringly delicious, vegan or not! I have already pinned this roundup! Beautiful group of Tacos! They are so fun because the possibilities are just endless! Thanks for sharing! Thank you!! endless possibilities are the best part about tacos! I definitely love tacos! Thank you for including my Raw Strawberry Mango Avocado Tacos! Thanks Uma! Excited to check yours out! What a great recipe roundup! Thank you for including my recipe - I'll be sure to share on social media! YUM! We eat tacos at least twice a week. This is such a great collection. Thanks! I think i need to make tacos twice a week in my house too! 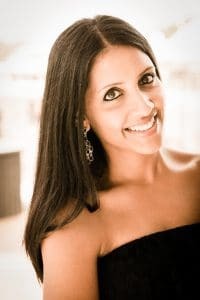 Thanks for including me Anjali. There can never be enough taco recipes! What a wonderful collection of tacos. Perfect for Cinco de Mayo thats around the corner. Thanks Manju! I have these all on my list to try! Thank you!! I love tacos and this roundup is full of awesome recipes. which ones are you using?? I did a taco night for a holiday party and did the buffalo cauli tacos, sweet potato chipotle black bean tacos, balsamic roasted portobello tacos, and the tikka masala tofu tacos! They were all a HUGE hit! I also bought taco stands which were fun. Couldn't even make it halfway through the list before my mouth was watering. Wow! These all look so good. it's an awesome list of tacos to make your way through for sure!